Having recently fallen under the spell of Enescu�s masterpiece, the opera Oedipe [review] , it was a pleasant surprise to find this double CD in the latest batch of review discs. I was totally unfamiliar with his piano music, but this multi-talented man, who first and foremost was one of the great violinists of his day, was also a brilliant pianist, admired by pianist colleagues of the calibre of Alfred Cortot, who stated that Enescu had a better piano technique than Cortot himself. And it is obvious that some of this music puts the pianist to severe test. The music, spanning a period of almost forty years, is also extremely diversified. The opening piece, the Prelude and Fugue, written when he was 22, has more than a nod in the direction of Johann Sebastian Bach, the prelude especially clarified and serene, but this is far from a pastiche and there soon creep in un-Bachian harmonies, reminding us that his teacher was Fauré and that the piano composer of the day was Debussy. The long Nocturne is even more impressionistic, starting softly almost immobile but slowly growing. It reaches no real climax at this stage but goes back to the initial mood, strangely hypnotic. After about seven minutes it changes character, becomes darker with menacing rumble in the left hand while the right hand sprinkles arabesques on the dark surface. Enescu�s night music is no idyll; Chopin and Field are in a completely different world; this is rather nightmarish but with rays of light to both illuminate and console. Fascinating music that is a challenge to both pianist and instrument. After 14 minutes it dies away and there is a long silence before we return to the stillness of the opening. This music was never heard during Enescu�s lifetime � it was found among his papers after his death. The Scherzo, written he was 15, starts with youthful nervous eagerness. After about two minutes there is a contrasting trio with a beautiful Brahmsian melody and then back to puberty again. Pièce sur le nom de Fauré was a commission from the Revue musicale which turned to seven of the aged masters former pupils to write a short piece each � among the others were Koechlin, Ravel and Florent Schmitt. It has an improvisatory character but is in fact utterly calculated with the little tune, built on the letters of Fauré�s name, repeated twelve times but skilfully hidden behind the decorations with which he fills his little canvas. CD2 contains his first and third piano sonatas only. Where is the second? Well, it doesn�t exist, but it once did � only in Enescu�s head, though. It was a finished composition that he, as in many other cases, never found the time to write down. He once said to a colleague: "If I could put down on paper everything I have in my head, it would take hundreds of years". I wonder what riches we would have had if the modern computer with all its possibilities had existed in Enescu�s time. Sonata No. 1 from 1924 was one of few works that had him temporarily abandoning the strenuous composition of the opera Oedipe. It is a bit strangely organised, has a long first movement, marked Allegro molto moderato e grave and it is serious and mostly dark. It begins with a simple descending motif that is soon immersed in a swarm of ideas, seemingly improvised. The second movement, instead of being slow is a Presto vivace, a short and whirling scherzo, actually a kind of perpetuum mobile. The slow movement instead comes last, starting on a repeated single note, very sparse music, reminding me of Arvo Pärt�s piano compositions. The whole movement feels like consolation finally reached after the darkness of the beginning and the hectic gaiety of the scherzo. Sonata No. 3, written ten years later, after having finished the opera, is light and full of invention, seemingly written by a harmonious and confident person. Nothing could be more wrong: in reality his private life was in a tumultuous state, his life partner Maruca having suffered a mental breakdown "which left her bordering on madness for the rest of her life". Enescu wrote in a letter to Edmond Fleg, the librettist of Oedipe: "I console myself by taking refuge in composition. The result is a new piano sonata, freshly arrived after Oedipe. It�s full of gaiety, in complete contrast to the atmosphere which surrounds it". Little more needs to be said about it, only that the central movement, Andantino cantabile, breathes harmony, deeply influenced by Romanian folk-music. The last movement is bouncy and jolly, like someone dancing around on a brightly sunlit summer meadow. 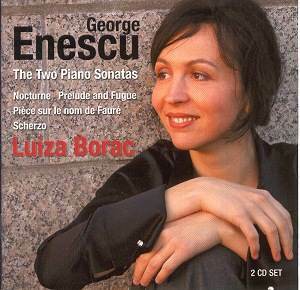 One must wonder why this music isn�t heard more often, but of course Enescu has never been a household name outside his native Romania and even great composers need first rate advocates to salvage them from obscurity; and this is exactly what Enescu has in the shape of Luiza Borac. The two discs, not too well-filled (but at a special,price), abound with ravishing pianism and although I have not been able to hear any alternative versions it is hard to imagine this music better played. Ms Borac has such delicate touch and also all the requisite power. She is recorded with exceptional truthfulness, the acoustics of St. Dunstan�s Church being obviously ideal for this music. The booklet has a lot of interesting biographical details as well as good notes on the music. Altogether this is a high quality product. Maybe Enescu at last is due for wider appreciation and then this set will be a valuable gateway. I echo many comments made by my colleague Göran Forsling about this set, but in some respects I can provide additional perspectives too. It follows Luiza Borac�s admirable first release of Enescu�s piano suites � a landmark recording and real ear-opener in many ways � as this one too proves to be. Arguably the major works in this set, in terms or artistic stature, are the two piano sonatas, though that is not to suggest the other pieces should be dismissed lightly. I seem to have written it many times before in articles and reviews, but the more I hear of Enescu�s piano writing, the more it impresses me. Cortot remarked with astonishment not only at Enescu�s compositional grasp but his facility in playing too: "Why is it that you, a violinist, should have a better technique at the piano than I do?" These, then, are far from straightforward pieces and even those springing from Enescu�s relative youth require an interpreter of vision, with sensitivity to line and gradation combined with passion all brought together under a brilliantly fearless technique. Luiza Borac matches these criteria to a remarkable degree. This is music one can senses means much to her, as it would be being Romanian, but the affection comes through in the total unity of her playing with idiom of Enescu�s writing. The early works here give us insights to the formative influences upon Enescu the entire musician, rather than solely as composer, pianist or violinist. The Scherzo contains Brahmsian touches, appropriate as the Hamburg master was one of Enescu�s early musical figureheads (Wagner and J.S. Bach were others). Enescu played violin in a Viennese orchestra under Brahms�s direction, and we have Enescu�s word for it that Brahms once heard him practise the violin concerto and offered him advice on the playing of suitable cadenzas. The Prelude and Fugue shows Enescu at work very much in the vein of J.S. Bach, though his approach is tempered by an already advanced assimilation of French compositional style. As a violinist Enescu performed practically the whole Bach canon from memory, and conducted the B-minor mass and concerti too � and at least we have some recordings of his labours for posterity. Whilst many talk, in my view often inaccurately, about the influence of Romanian folk music (or, worse, gypsy music which is entirely another thing) upon Enescu�s compositions, Bach as the bedrock to his musical being remains under-acknowledged. This Prelude and Fugue, along with the first and second piano suites (1897 and 1901/3 respectively), demonstrate the influence. Though his compositional voice became more individual as the years advanced what he never lost from his understanding of Bach was the importance of form within music. The homage to Fauré - one of several commissioned from the great man�s young composition pupils - takes the letters of Fauré�s name and using them as notes weaves a web of some intricacy, so that the many repetitions are hardly noticeable, but such subtlety Enescu already held firmly in his grasp. By contrast the Nocturne shows another facet of Enescu�s piano style � his love of dominating left hand chords. This is a feature that permeates many early works, though even the third violin sonata demonstrates an unwillingness to totally relinquish the effect these produce. Far from being a Nocturne of Gallic geniality, Enescu presents a vision of idiosyncrasy and great inventiveness � and not a little disturbed in its vision too. All of which comes as grist to the mill of Borac�s musical and imaginative realisation. The first piano sonata is the lesser known of the two that exist. Structurally it seems slightly odd, the slow movement coming last after two movements of varying dynamic impetuousness that suggest, but do not reply upon, improvisatory wilfulness. However the lasting impression is one of individuality and some contemplation on the part of the composer, who laid aside his magnum opus, the opera Oedipe, to write the sonata. Borac succeeds in capturing with great effectiveness not only the frenetic activity but also the spirit of what Romanians call dor (a mixture of longing, nostalgia, lovesickness and sadness) that she finds within these pages, and to an extent I do too in the controlled, reflective ending. All we know of the second � fully formed and realised in Enescu�s head, but alas never made the journey to paper � is that �she� was in B flat major. Perhaps this is the juncture to mention other available releases. Especially where Enescu is concerned I am of the opinion that there are no competitors, merely contributors to overall understanding, given that the world is still young in accepting this music. (How much further behind still lie some other Romanian composers whose works are all but unheard!) Cristian Petrescu on Accord (3 CDs: 4762397) has decent sound, though not comparable to Borac�s, and on the whole takes too many liberties with Enescu�s time and dynamic markings. This said, his was about the only available survey of Enescu�s piano works available until now. Had I to choose just one version the Borac would be my choice. However when it comes to the third sonata things are not quite so straight-forward: enter Dinu Lipatti with his own special view of the work (EMI 5 67566 2). Being Enescu�s God-son, Lipatti�s interpretation verges on being a family affair, and his affection for the music is apparent. As is so often the case with Lipatti�s meagre quantity of captured legacy the result is marred by the recording quality; it comes from Swiss Radio and was recorded on 18 October 1943. He is caught to winning lyrical effect in the middle Andantino, though the outer Vivace con brio and Allegro con spirito show him in sparkling temperament too. Nadia Boulanger�s co-operation is documented with this recording but EMI fails to state the nature or extent of her involvement. Borac enters the home strait of her set unafraid of Lipatti. She too displays much of the same fleetness, intuitive musicality and sureness of touch with her playing that Lipatti, one feels more than completely hears, brings to his. Listening to her recording I was struck by memories of hearing Enescu�s piano played two years ago in Bucharest by students of the music academy. What struck me then was the voicing of Enescu�s instrument � how it effectively had three voices: a deep and rich bass allowing his love of accords to come through, a willowy and pliant middle register, and a top register without hardness but bell-like in its clarity. Given that Borac has played Enescu�s baby grand (a booklet picture confirms this) it can be no coincidence that the piano used here brings forward similar qualities. Lipatti though still has much to offer, and I would not be without either version. Alright, so we are short on playing time for two discs, but given that they retail at a special price that�s no great pity � particularly as the artistic standard, recording quality and supporting notes are of high order. Greater advocacy for Enescu�s genius would be hard to dream of: bravo, Luiza Borac!